I can still remember how the darkness seemed to be alive when I was a child. How it seemed to reach out for me. The thick, blurry-edged shapes would form and flee on my closet door, wisps of smoky purple against the moonlit dull yellow paint. I first saw the skeleton there when I was three, but I remember him vividly. My three-year-old self was sure that I had been wide awake when I saw him emerge from the billowing shadows. A chill slithered up my spine and my blood pumped cold through my veins. The face was yellowed bone. 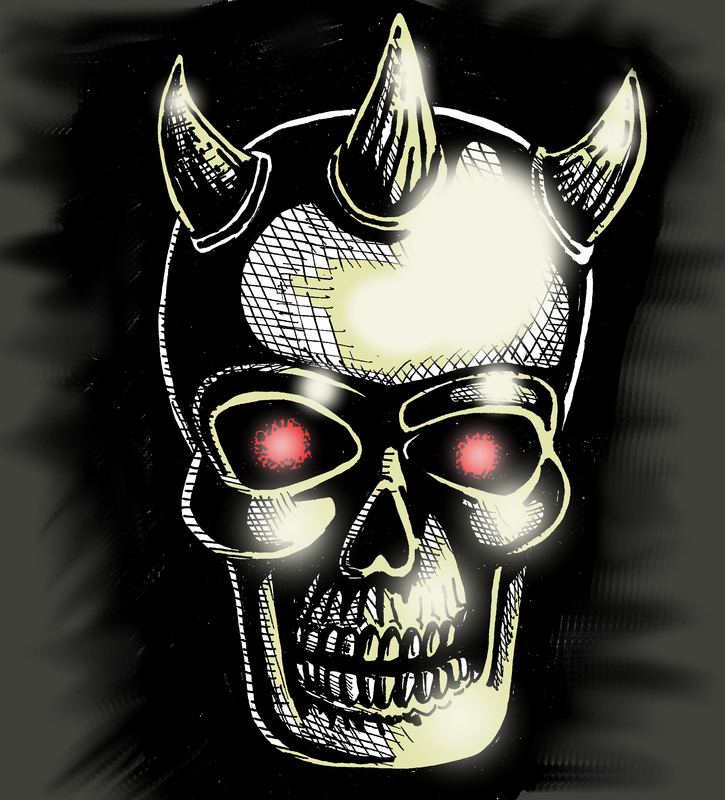 The eye sockets glowed red with malignant spiritual evil. His head was crowned with three horns growing straight out of the bone. My body shook uncontrollably under the covers where I hid. I knew he would come for me. Why else would he have appeared in my room? He was going to kill me. Finally, I could no longer stand hiding. I slowly pulled the covers down from around my head. He was gone, but I expected he would reappear the minute my foot touched fluffy brown carpet fiber. I slid my back against the wall and moved as stealthily as a chubby little boy could, inching my way toward escape. Once I reached the hallway, I ran for my life and threw open my parents’ door. “There’s a skeleton in my room,” I panted. My parents were not in any way concerned. In fact, my father rather crossly commanded me to return to the place that I knew would be my end. Amazingly enough, I lived to tell the tale. In fact, I have lived long enough to have children of my own who throw open my bedroom door and proclaim that monsters hunt them in their rooms in the darkness. The darkness doesn’t come for me anymore. Even if it did, I wouldn’t notice. 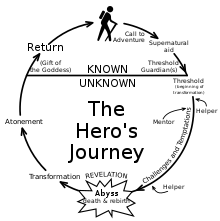 With adulthood comes fatigue, which I believe firmly accounts for the disappearance of Nyctophobia. It’s not that adults are too brave to be afraid of the dark, we’re just too tired. It is strangely satisfying to feel that fear again. Aren’t we odd as human beings? We abhor having certain emotional responses, but in a way we revel in them. Why else would we create stories to force ourselves to feel vicariously through the characters we read about? It is a great thrill to feel with them as they save the world or fall in love. For some reason, we love to cry with them, feel rage with them, and tremble in fear with them just as much. So, Living Bones started as a dream that I had. A nightmare. It became a book as I was driving home from the Willamette Writers Festival where I had spent the day learning about writing and pitching stories in hopes of landing an agent. The day had been fun and successful. I had successfully pitched my stories to many agents. I then met an agent named Bree Ogden, who listened to my pitches politely but then told me that she was really looking for middle grade horror. 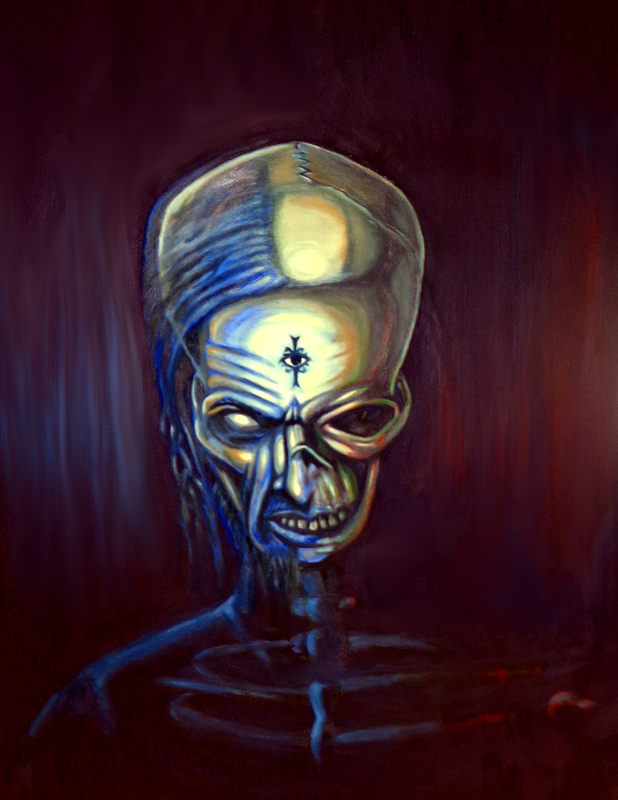 I don’t write horror, I thought to myself. On the drive home, another thought came to me. An agent had just told me exactly what she was looking for. Why in the world wouldn’t I try? The next questions that I asked myself were very logical now that I knew I was going to try to scare young people. What scared me when I was a kid? What scares me now? And that darn skeleton popped right back into my head. I smiled when I saw him there, in my brain, because he still gave me the creeps. I had my villain, but there was so much left to decide about who he was and how he was able to move around as a bunch of bones. The story really took off from there. I’ve always believed that a really good story has to have a really bad villain. Villains have the ability to either deflate or inflate the conflict. My skeleton lost the red eyes and horns and became Mordecai Bleak. And Mordecai has been giving people the creeps ever since he turned up on the pages of Living Bones. To make a long story short, Bree read Living Bones and became my agent. Spencer Hill Press agreed to publish Living Bones. It has always been my dream to be an author, and now I am one. In other words, my nightmare made my dream come true. Learn more about the author, Jared Agard, by visiting his author page. 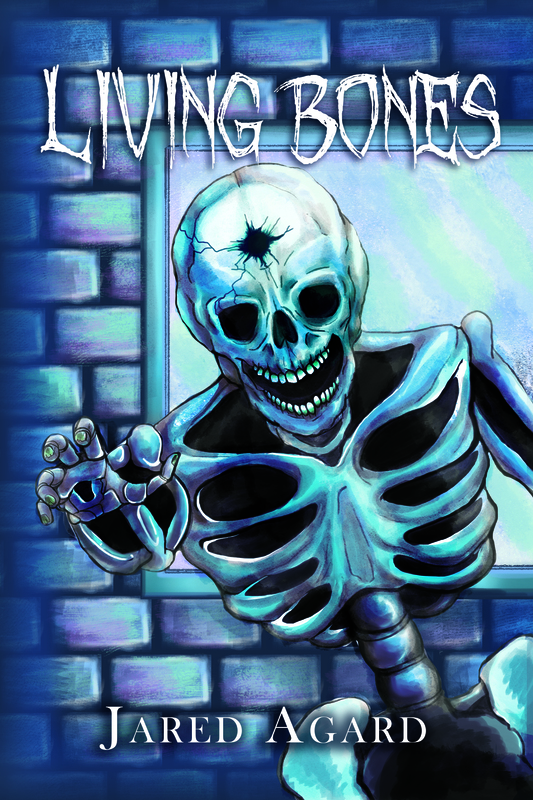 Learn more about Living Bones by visiting it’s book page. The girl with the flamethrower you’re looking at? 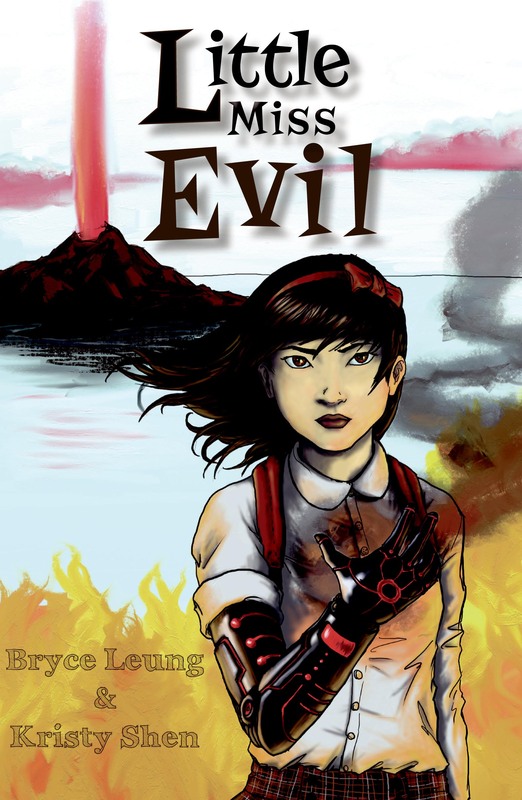 That’s Fiona Ng, the protagonist of our debut adventure/thriller LITTLE MISS EVIL, coming out in March 2015. She hurls fire, she hurls insults, and is generally someone you don’t want to mess with. She was also a TON of fun to write. I have to admit. We love villains. Every time we watch a movie or TV shows, it’s always the villains that mesmerize us. Whenever we go back and re-watch our favorite movie, we constantly find ourselves fast-forwarding over the scenes where the hero is doing good-guy stuff to get back to the scenes where the villain is stealing the show. The thing is, most heroes share the same traits: bravery, selflessness, and always standing up for what they believe in. But what makes a good villain is completely different from character to character. There’s no pattern. And that’s what makes them so interesting. For example, Prince Zuko, from Avatar starts off as a single-minded assassin with an inexplicable hatred of Ang. But as you learn more about him, you realize he’s just a broken, battered kid trying to earn his Father’s love. And then you find yourself almost rooting for him, something you totally weren’t expecting. And then there’s Elsa from Frozen. The cool (pun intended) thing about her is that she becomes the film’s villain unintentionally. She imprisons herself in an ice castle because she’s afraid of hurting anyone, so her intentions were good. But then in the process she nearly kills the entire town. And finally, there’s our personal favorite villain—Joker from The Dark Knight. He’s so unpredictable that the entire time you’re watching him you’re on the edge of your seat wondering what he’ll do next. Betcha weren’t expecting THESE three to show up in one place, INTERNET. In short, we just love a good villain. 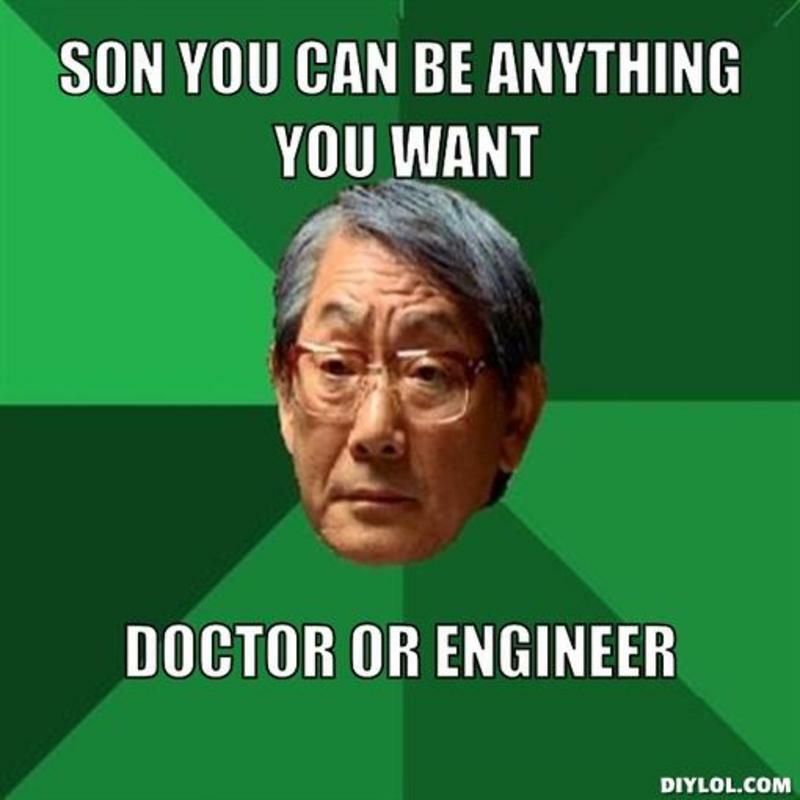 So we thought “how cool would it be to twist this Asian parent thing on its head?” What if the protagonist was Asian and already wants to be a doctor, but then the Dad wants them to be an evil super-villain instead? But then when her Dad goes missing, she’s forced to take over her family’s evil empire, and she gets shoved into a world she’s been trying so hard to avoid. But what really shocks her is when she finds out that she’s terrifyingly good at it! So that’s the story behind the creation of Fiona Ng, reluctant super-villain extraordinaire. Again, you can see her in LITTLE MISS EVIL, coming out in March 2015. She was so much fun to write, and we hope you love her as much as we do. Just remember not to get on her bad side. 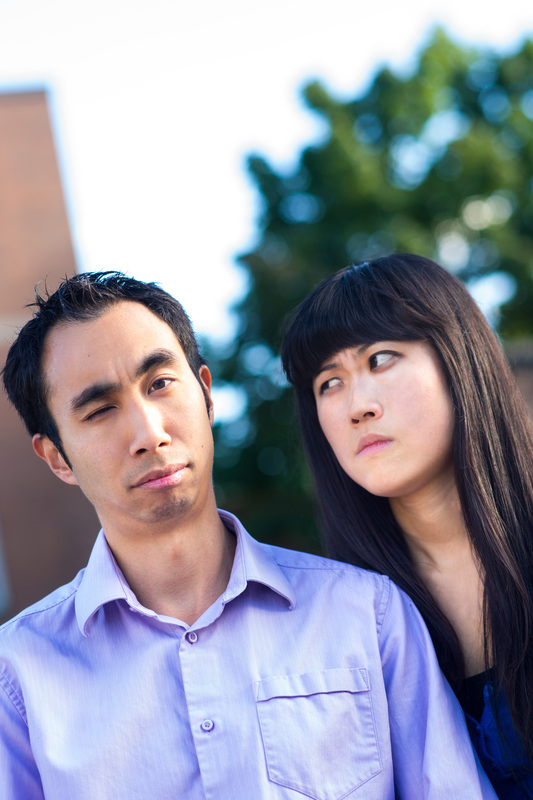 Bryce and Kristy are a tag-team writing duo with way too many voices in their heads. As engineers living in Toronto, they can’t be safely contained by mere cubicle walls, and therefore must spend every other waking moment writing to keep the crazy from leaking out at the office. When not writing or working, they spend their time parachuting into volcanoes and riding polar bears while tossing dynamite at rabid kangaroos. Yup, that’s right. Sometimes they can’t even believe how awesome their lives are. You can pre-order Little Miss Evil from :Amazon, B&N, and any fine bookseller near you! While it is quite obvious that the Adventures of Finn MacCullen series is based on Celtic mythology, some readers may also notice how much of the hero’s journey is reflected in the books as well. 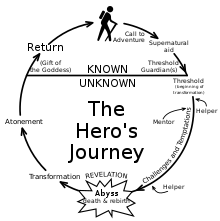 Like so many writers, especially writers of fantasy, I have been influenced by Joseph Campbell’s pivotal work, The Hero’s Journey. It was the part where the hero meets up with his mentor, and who travels alongside, teaching and instructing his young protégé, that has always fired my imagination. Obi-Wan Kenobi and young Luke Skywalker; Professor Dumbledore and Harry Potter; Ranger Halt and Will; Gandalf and just about everyone in the Fellowship are all great examples. I decided in my Adventures of Finn MacCullen series to focus on young Finn’s apprenticeship under the tutelage of the Knight, Gideon Lir. You see, I have often thought that this was such an important phase in the hero’s journey; the relationship that will shape so much of the protagonist’s personality. Which was a blast to write, as I could explore not only Finn’s coming-of-age, but also the developing “father/son” relationship between the two. Finnegan MacCullen: My protagonist is based loosely on the Irish legend of Finn McCool or Fionn mac Cumhail. This story cycle, called The Boyhood Deeds of Fionn mac Cumhail, follows the adventures of Finn as he grows from boy to legendary warrior. Lir: The warrior-father from The Children of Lir story cycle. All I really took from that cycle was the name Lir. However, Gideon’s name is a nod to the legendary Welsh figure Gwydion. That character was a warrior, but also a bit of a trickster. I took that trait and gave Gideon a sarcastic bent. Mac Roth: A friend and strong right arm to one of the early kings of Ireland. A fitting name for Gideon’s old friend and avuncular figure to Finn. Scáthach: A formidable warrior and instructor of the young heroes. She trained many a famous figure from Celtic mythology, including the legendary warrior, Cúchulainne. “Cu-Chulainne,” by the way, means “The Hound of Culain.” He is often referred to as the Achilles of Celtic mythology. Rath: A fortified ringfort. Ruins of raths can still be found scattered throughout Ireland. And, yes, Rí is another word for Ruler or King. warp spasm: This, too is a part of Celtic lore. This battle frenzy gave warriors extra strength and speed and helped them ignore injuries until after the conflict. torc: A neck ring made from strands of metal twisted together. Most are open-ended at the front and were worn as a sign of nobility and high social status. Many examples of these have been found in European Bronze Age graves and burial sites. deadnettle: A plant used as a curative tea amongst various peoples in northern Europe and the British isles. Amandán: Mythical Irish and Scottish figures which are said to reside in fairy mounds. They are feared because it is believed their touch (called the fairy stroke or poc sidhe) is said to cause paralysis or death. The Song of the Tuatha De Danaan: The words that open all the books, and that are recited throughout, are a portion of the famous early Irish “Song of Amergin.” This translation is from the article “Echoes of Antiquity in the Early Irish ‘Song of Amergin’” by Lloyd D. Graham, 2010. Learn more about Darby by visiting her author page. When I’m brainstorming stories, my favorite thing to do is go for a walk in the woods. That’s how I came across the inspiration for Deadwood. I was looking for ideas, and I found a tree. I had just read Well Witched by Frances Hardinge and Enchanted Glass by Diana Wynne Jones, and I wanted to write a book like that – about ordinary kids who stumble upon magic and danger in the real world and have to figure out how to set things right. All I needed was a unique kind of magic that I hadn’t seen before. 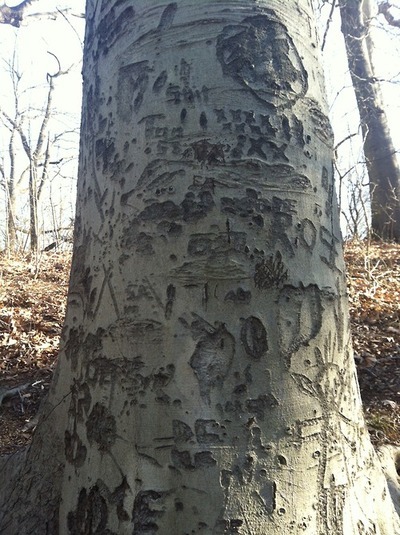 On other days, I had already noticed that just about every beech tree I ever saw was carved with messages, and I always wondered about the people who put them there. Were they still alive? Did the messages of love stay true? Did KT still love JB? At the same time, carving a tree is harming a living thing. I couldn’t help feeling sorry for the trees. But on that particular idea-hunting expedition, when I saw one of my favorite carved trees, I was already thinking about magic. What if the carvings on the tree were a kind of spell or curse? And if the tree could talk, what would it say? I looked for a scientific underpinning that would make sense in a contemporary novel with kids that seemed like real people. My reference manual was the 1973 alternative science bestseller, The Secret Life of Plants by Peter Tompkins and Christopher Bird, which explores the idea of plant sentience. This was the book popularized the 1970s idea that you should talk to your plants to keep them healthy. Most of the serious-sounding evidence in the book is not real science, but the David Attenborough 1995 BBC/Turner Broadcasting mini The Private Life of Plants is more scientifically rigorous and covers related territory about plant survival mechanisms. I love stories with magic in them, and when I’m writing, I like to find an explanation that’s somewhat plausible – I want readers to feel like the events in the story could really happen. People all over the world have believed that plants have spirits, but if a real kid came face to face with a talking tree, they wouldn’t just accept it and talk back right away. It wouldn’t make sense. I wanted it to make sense in the book that became Deadwood. The story and characters emerged as I wove together logic, wonder, skepticism, faith, and yes, a little bit of magic. For more pictures and information about tree carvings (and a bunch of pictures of trees that I think look like people!) visit my tree blog,. Treeandtwig.tumblr.com. 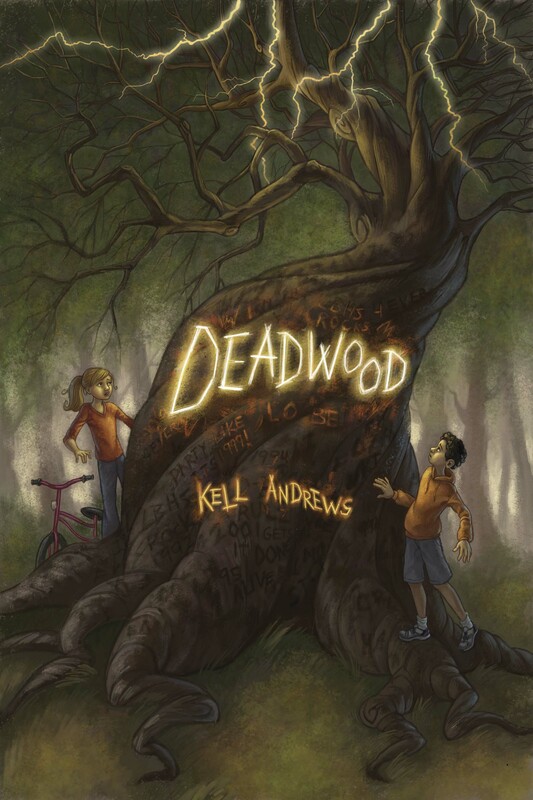 For more about Deadwood and me, visit kellandrews.com.